Made of Stainless Steel, Vapour Baffle, Condensing Tube and Lid are Stainless Steel. This still is fitted with Immersion type Elements. The Stopcock fitted to the unit. 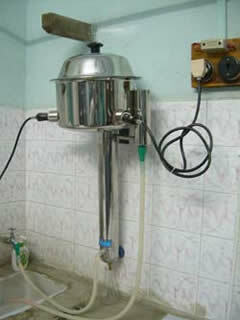 The still is provided with Wall mounting Iron Bracket to be fixed on the wall which the still can rest. Supplied with 3 Core Wire and plug to Work on 220 volts A.C supply (without Rubber Tubing). 1. Spare Element for above Distillation Apparatus: 2 K.W. 2. Low Water cut-off Device.for 2litre and 4 litre cap. 3. Low Water cut-off Device.for 6litre and 8 litre cap. 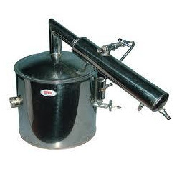 Double walled: inner and outer body and boiling condenser also made of stainless steel. 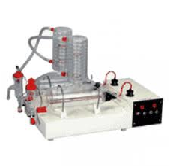 This method of producing and storing distilled water is designed specially to meet the needs of the MODERNHospital and Laboratory Research. To work on 220 Volts A.C supply with 3 core wire and plug (without rubber tubing). 4. Low Water cut-off Device.for 10 litre and 20 litre cap. SGM water distillers produce highly treated and disinfected water for laboratory usage. The distillation process removes minerals and microbiological contaminants and can reduce levels of chemical contaminants. Water distillers are neither intended to treat water that is visually contaminated nor intended to convert waste water to safe, microbiologically. 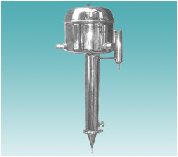 The distillation apparatus consists of flask with heating elements embedded in glass and fused in spiral type coil internally of the bottom and tapered round glass, joints at the top double walled condenser with B-40/B-50 ground glass joints, suitable to work on 220 volts, 50 cycles AC supply.